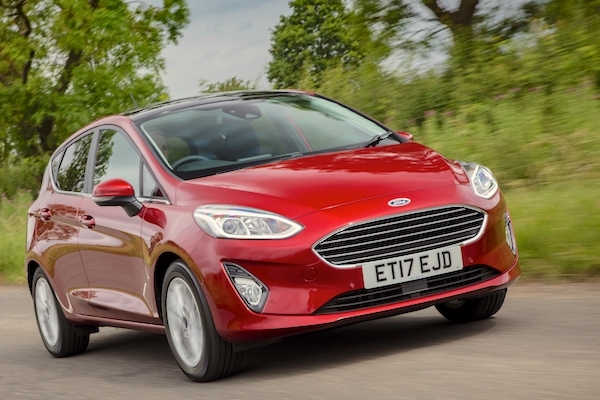 The Ford Fiesta hits its highest market share in the UK in almost a year. 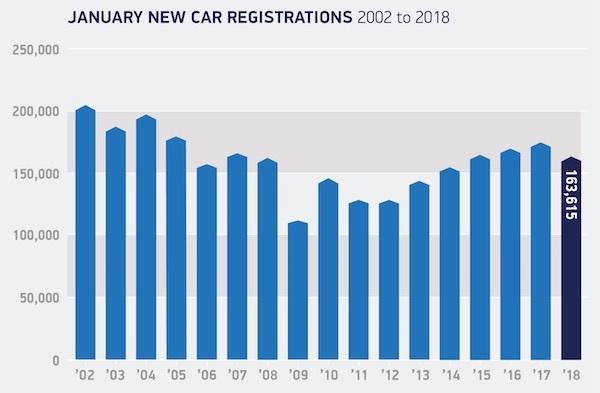 UK sales record their 10th consecutive month of year-on-year decline in January at -6.3% to 163.615 registrations. Business sales are the hardest hit at -29.7% to 4.686 and 2.9% share vs. 3.8% in January 2017, while private sales are down 9.5% to 69.416 and 42.4% share vs. 43.9% a year ago and fleet sales over-perform at -1.8% to 89.513 and 54.7% share vs. 52.2%. SUVs are the only segment to gain volume year-on-year at +6.6% to 20.2% share. Petrol sales are up 8.5%, diesel sales down an abysmal 25.6% and alternatively fuelled vehicles (AFVs) are up 23.9%. In the brands ranking, Ford maintains its leadership despite a 14% drop to 12% share while Vauxhall manages to climb back into 2nd place for the first time since March 2017 in spite of a 9% year-on-year decline, edging past Volkswagen (-3%) for just 73 sales. Mercedes falls 9% but climbs back to #1 premium after falling to #3 in December, distancing Audi (+1%) and BMW (+6%). Toyota (+7%) is the biggest gainer in the Top 10, outselling Nissan (-30%) for the first time this decade. Further down, MG (+132%), Porsche (+45%), Mini (+26%), Abarth (+25%), Mitsubishi (+17%) and Lexus (+11%) all go against the grain and post double-digit gains. In the models ranking, the Ford Fiesta is down just 2% to hot 5.1% share, its highest in the UK since February 2017, topping all 4 UK nations for the first time since June 2016. Below, the VW Golf (-21%) continues its streak of 9 consecutive months inside the UK Top 2, with the Ford Focus (-14%) back to the third spot it held over the Full Year 2017 above the Nissan Qasqhai (+10%). The Vauxhall Mokka X leaps to 5th place overall, its highest UK ranking since last August (#3), the Mercedes A-Class confirms it is now a regular fixture atop the UK charts, posting a 5th consecutive Top 10 month at #6, the Kia Sportage is up to #7 despite sales down 14% and the Ford Kuga makes it four SUVs in the UK Top 9 this month. Full January 2018 Top 42 brands and Top 10 models below.